The Alberni-Clayoquot Regional District is a large and diverse area of over 6,600 square kilometers centrally located on the west side of Vancouver Island. It is bordered by the Beaufort Mountain Range to the east and the Pacific Ocean to the west. The city of Port Alberni is the largest city and commercial hub of the region. Port Alberni currently has a population of over 18,000 of the total regional population of over 31,000. 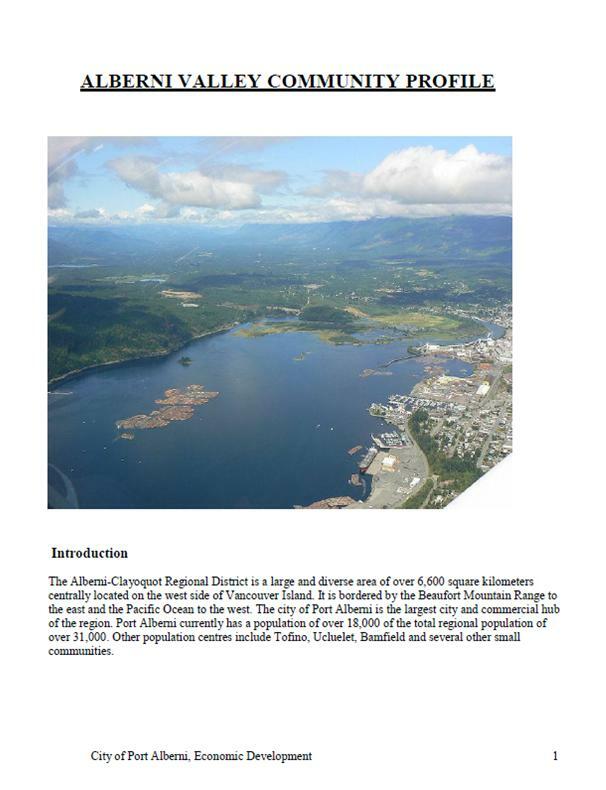 Other population centres include Tofino, Ucluelet, Bamfield and several other small communities. The highest vertical drop waterfall in Canada, Della Falls, is located at the western end of Great Central Lake near Port Alberni. In 1902, the Bamfield cable station near Port Alberni was constructed as the western terminus of a worldwide undersea telegraph cable. The province's first park, Strathcona Provincial Park, was established in 1911 and is located just north of Port Alberni. Canada's first female Prime Minister, Kim Campbell, was born in Port Alberni in 1947. The world’s largest fire fighting aircraft, the Martin Mars, based just outside Port Alberni at Sproat Lake were put into service in 1959. Port Alberni has been designated as the Salmon Capital of the World and the World Fishing Network’s - Ultimate Fishing Town. 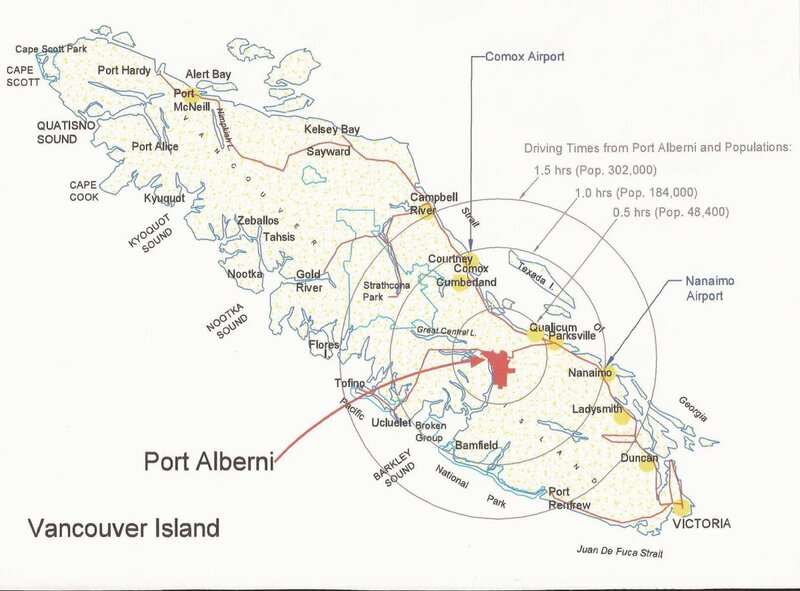 Port Alberni is the shore station for Neptune Canada's 800km electro fibre optic cable. (.PDF) For the entire Alberni Valley Community profile CLICK HERE. Our community profile provides a composite "picture" of our city and surrounding area. The profile highlights our lifestyle, climate, demographics and economic conditions. The City of Port Alberni and the surrounding region thrived for several decades with an economy based on the management and processing of natural resources. The main industries were forestry, commercial fishing, and later tourism provided a more diverse economy. Significant changes in international commodity markets and resource availability resulted in challenges for many parts of the world that depend on resource use. Port Alberni has responded to these challenges by developing an economy that is more diverse and flexible to changes in markets. The culture of organizations, including government, owners, managers and workers have accepted and embraced change to protect the values that make Port Alberni great and take advantage of new opportunities to make it better. The manufacture of wood products continues to be the key driver of the local economy, as it has been for several decades. A wide range of products are manufactured either to finished form or shipped elsewhere for further manufacturing and sale. Wood commodities exported range from unprocessed logs, to lumber, to paper to full value-added finishing and artisan products. Many other commodities are produced in the area for processing and shipping to markets. The diversity of the area is demonstrated by the other products that it produces that include: field and greenhouse grown agricultural products including award winning wine, both wild and farmed seafood, boats and a range of software and other knowledge-based products. The region’s economic backbone continues to be the management of its sustainable resources. Local oceans are home to plentiful stocks of several species of wild pacific salmon, cod, halibut as well as various shellfish species including clams, oysters, mussels and crabs. Commercial use of these wild fisheries is supplemented with aquaculture farms in certain locations of the region. exported include: logs, poles, piling, a wide range of lumber products, paper, shakes and shingles. mushrooms, berries and florist salal. provincial government and the community of Port Alberni. paper plant, and several sawmills and other wood processing facilities. There are many industrial facilities located in the city provide services to support larger local businesses and to customers outside the communities. Other businesses in the area that might be considered industrial are very diverse, and include the areas of: aviation, marine, trucking, agriculture and aquaculture. feed for the livestock industry. The Alberni Valley Agriculture Plan (2011-2031) indicates that, there is significant capacity for increased agricultural production in the Alberni Valley. The demand for (and interest in) local food has never been stronger. Consumers want to buy food they trust from people they trust. The Alberni Valley has experienced farmers, with quality soils, climate and capital available to produce more. grow this industry in both fin fish and shellfish facilities. freshwater lakes and streams. This area of Vancouver Island is popular for its salmon sports fishing. Fishing charters operate year round and the rewards include steelhead, halibut, cod and of course, five species of salmon. windsurfing, hiking, cycling, golfing, skiing, snowmobiling and wildlife viewing. A long history of support for organized sports, arts and culture, festivals and other entertainment interests are available in the valley and surrounding areas. A system of local parks and a full complement of specific or multiple use facilities are maintained for the public to enjoy. medical needs. The City of Port Alberni maintains a complete program of essential services. Up-to-date services include fire protection, safety, emergency preparedness, water works, sewage and waste management. Port Alberni and area has a temperate climate that is influenced by a prevailing western flow that result in periods of extended high levels of precipitation during winter months (November to February), and equally extended periods of dry, warm weather during summer months (May to October). The highest precipitation is typically in January at an average of 309 mm (12 inches) for that month, with the lowest usually in July with a monthly average of only 29 mm (1 inch). Transition periods in Spring and Autumn have weather patterns that are more variable. Government services and community infrastructures are in place to provide opportunities to enjoy the benefits of the area throughout the year. than a decade. Ages of the population are generally evenly distributed with the largest proportion in the 45 to 64 age class. attracts people from across Canada to retire here. These features along with other family oriented benefits draw younger people to work in local businesses. The region has a full complement of traditional education opportunities from pre-school, elementary high school college and university. Pre-school and elementary schools are available throughout communities. A new state-of-the art high school is in place in 2012. Many schools are within walking distance from homes. Dedicated bus services are available to provide transportation to students that live beyond walking distance. North Island College has a campus located in the City of Port Alberni with a varied curriculum in both trades and academic courses. Certificate, diploma and continuing education programs can be completed in Port Alberni or through the main campus in the Comox Valley. The Justice Institute of British Columbia offers paramedic focuses in conjunction with North Island College. The Pacific Coast University for Workplace Health Sciences is a post-secondary degree granting education and research institution located in Port Alberni. The facility specializes in workplace safety, health promotion, return to work and disability management, comprehensive rehabilitation and disability leadership studies. Certificate, diploma and degree programs are provided through Vancouver Island University at Nanaimo. Additional colleges and universities are located on southern Vancouver Island, at Victoria. While formal education is always encouraged. One of the great strengths of the workforce in the Alberni area is the peoples’ commitment to excellence through skills obtained from previous generations and on-the-job training. A culture of life-long learning and continual improvement continues to contribute to safe and productive teams that provide employers and customers with high quality products. In the province of British Columbia, taxes and fees are levied by both the provincial government and by the federal government of Canada for various activities including: duties, employment, manufacturing, buying and selling goods and services. The collector of the taxes and fees is governed by the services that are provided by regulatory entities. Structures, administration and fee schedules are provided by the provincial or federal government depending on the appropriate jurisdiction. There are two sets of local tax assessments in addition to federal and provincial taxes. Both are based on the assessed value of private land and any improvements on that parcel of land. One set of taxes is for land within the city of Port Alberni; the second is for areas outside the city boundaries and are administered by the Regional District of Alberni-Clayoquot. Real estate prices in Alberni tend to follow the general trends that are occurring in other communities in Canada. While there are some increases and decreases in values based on economic conditions real estate prices have been generally stable over the past five years. By having economic development that endeavors to assist existing businesses to be successful while promoting new businesses that provide diversity to the local economy, the City of Port Alberni optimizes the benefits to our citizens. This diversified economy helps to protect the value of existing homeowners from potential tax assessment fluctuations, while providing a level of security that encourages new entrants into the local real estate market. Overall, real estate is considered to be a very good value for the lifestyle and all the services available in the area. In particular, people moving from Vancouver, Victoria or other relatively high priced communities find this area to be a bargain. employers at this time are: Vancouver Island Health Authority, Western Forest Products, School District 70, Catalyst Paper, Wal-Mart, Coulson Group and the City of Port Alberni. After several decades of relative stability, this area has gone through significant change. People who have worked here have learned to adapt to change to ensure that they can continue to work and live in this beautiful place with so many benefits. Average income levels tend to be somewhat lower than the average for British Columbia, as well as lower than average for resource-based communities in the province. This is balanced with the lower overall cost of living, particularly the cost of housing. The declines of average income levels are partly the result of changing demographics from the reduced workforce component; as well as the fact that retiring people have discovered the benefits of living in the Alberni area. The change is also the result of reductions in employment levels, particularly in the forest industry, that have included higher paid workers with many years of service. New positions that are coming available with the recovery of the forest industry have allowed newer entrants into the workforce that typically have relatively lower income and benefits. Relationships between Governments and First Nations communities have had a regrettable history for many years. While much is left to be done, significant progress has been made in the Port Alberni region in the form of treaties and other agreements; as well as a general greater commitment to communicate and to work together to provide better opportunities for everyone who lives in this region. The vast and healthy forests on coastal British Columbia are being utilized for the many uses of wood fibre and related benefits. The catastrophic damage to the forests to the interior parts of B.C. and other parts of North America by Mountain Pine Beetle does not occur in coastal forests. Scientific advancements and the need for new products from wood fibre provide an opportunity for Port Alberni that has been suggested to exceed anywhere else on the coast. Potential products from forest biomass range from building materials, pharmaceuticals, chemicals to renewable energy. Some capital investments made over the years have the potential to be revitalized to be more profitable through the introduction of new technologies to infrastructures that are in prime locations but are currently underutilized. Support for new investments is available from several sources within and outside the Port Alberni. Tourism use has increased over the years, but it is still considered to be not fully appreciated. World-class recreational opportunities and related facilities exist, and receive global recognition. The people of Port Alberni and the surrounding area would like more people to come and share what they have. Issues related to the downturn in the global economy in general, and the forest industry in particular over the past few years have been difficult to the people of Port Alberni. They have accepted the challenge and adapted to change the way they do business. Managers and workers know how to work safely and productively in an effective manner to meet the needs of investors and customers.